Beyond Cybersecurity: Protecting Your Digital Business arms your company against devastating online security breaches by providing you with the information and guidance you need to avoid catastrophic data compromise. Based upon highly-regarded risk assessment analysis, this critical text is founded upon proprietary research, client experience, and interviews with over 200 executives, regulators, and security experts, offering you a well-rounded, thoroughly researched resource that presents its findings in an organized, approachable style. Members of the global economy have spent years and tens of billions of dollars fighting cyber threats—but attacks remain an immense concern in the world of online business. The threat of data compromise that can lead to the leak of important financial and personal details can make consumers suspicious of the digital economy, and cause a nosedive in their trust and confidence in online business models. 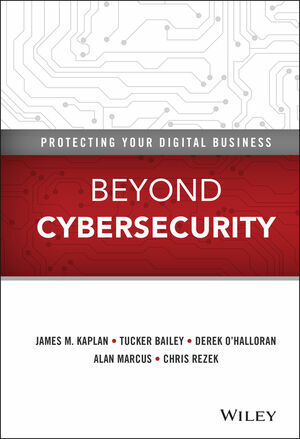 Beyond Cybersecurity: Protecting Your Digital Business is an essential resource for business leaders who want to protect their organizations against cyber-attacks. JAMES M. KAPLAN is a partner with McKinsey & Company in New York. He co-leads McKinsey's global IT infrastructure and cybersecurity practices. TUCKER BAILEY is a partner in the Washington, DC location of McKinsey's Business Technology Office. DEREK O'HALLORAN is Head of Information Technology and Electronics Industries at the World Economic Forum. ALAN MARCUS is Head of Information and Communication Technology Industries at the World Economic Forum. CHRIS REZEK is a senior expert consultant with McKinsey & Company in Boston.